Since their development in the 1970s,1 2 peripherally inserted central catheters (PICC) have become an integral part of modern healthcare. PICCs are frequently inserted in hospitalised patients to maintain venous access and facilitate administration of vital therapies, such as antibiotics and chemotherapy.3 4 Moreover, PICCs allow patients to receive these therapies outside the hospital setting, enabling early discharge and transitions of care to alternative settings. Unfortunately, our knowledge regarding PICC-related complications remains incomplete. Although PICCs are often inserted during hospitalisation, they facilitate intravenous treatment outside of this monitored setting.4 11 Despite this, little attention has been paid to complications as experienced by patients following PICC placement and especially after hospital discharge.12 13 Several qualitative studies have explored specific patient experiences, such as quality of life among patients with cancer14 or after a symptomatic deep vein thrombosis (DVT),15 and the impact of arm choice on daily activities.16 On the other hand, issues such as frequency of minor complications (such as insertion site redness), how PICCs impact daily activities and other concerns that might arise posthospitalisation have not been fully examined. Understanding these issues from the patient perspective is a critical first step for identifying PICC-associated patient concerns, which could result in both warranted and unwarranted healthcare utilisation, and for making care more patient centred. Thus, we sought to systematically elicit and characterise patient-reported concerns to provide a more comprehensive picture of PICC use and potential complications as experienced by patients during and beyond hospitalisation. We conducted a prospective observational study involving patients receiving care at four US hospitals. From August 2015 through May 2017, patients who had a PICC inserted for clinical care during a hospital admission were recruited and followed for 70 days from the date of initial PICC placement. Follow-up continued regardless of whether the PICC was removed, exchanged or replaced. Information about potential complications was collected through patient self-report within 3 days of initial PICC placement and then at 14, 30 and 70 days using a standardised questionnaire. Selected data elements were also collected through a medical record review conducted by research staff at each site. Participating hospitals included two Veterans Affairs medical centres and two academic centres in Michigan and Texas. Each weekday morning (Monday through Friday) research staff used electronic medical records or lists provided by PICC inserters to identify patients who received a PICC. Research staff then visited patient rooms to confirm eligibility. Potentially eligible patients included those who: (1) were at least 18 years of age; (2) were hospitalised on an acute care unit, including medical/surgical wards, intensive care and progressive care units; (3) had a PICC that was placed for the first time during the hospital stay (ie, new insertion that was in place for ≤3 days); and (4) spoke either English or Spanish. Exclusion criteria were: (1) did not have the capacity to provide self-consent or participate in the interview/assessment process (eg, obtunded, severe dementia, delirium); (2) refused to provide written informed consent to participate; or (3) had previously participated in this project. Patients deemed eligible based on these criteria were invited to participate in the study. After a patient agreed to participate, research staff obtained informed consent and conducted a brief structured in-person interview. Those who chose to participate also received a magnet (either in the shape of the state in which they were recruited or branch of military in which they served) as a thank you for their participation. The initial interview included general demographic questions as well as questions about the PICC insertion process, including reason for PICC insertion, type of professional who placed the device, number of insertion attempts and whether the patient experienced any pain/discomfort/bleeding/other trauma during placement. Follow-up assessments were conducted in person if the participant was still hospitalised or by telephone if discharged at approximately 14, 30 and 70 days after initial PICC insertion. These assessments consisted of a structured set of questions to first ascertain if the PICC was still in place or had been removed, and if removed, whether another PICC had been placed. Next, patients responded to a series of yes/no questions about signs or symptoms (during the past 7 days at the 14-day call and past 30 days at the 30 and 70-day calls) that might indicate a potential PICC-related complication. Specific signs or symptoms of a potential medical complication for which participants were queried included the following: site redness; redness, pain or swelling in the arm or shoulder; chest pain, shortness of breath or difficulty breathing that required emergency care; pain, swelling, redness in legs or calves; and fevers, chills or symptoms suggestive of an infection that required them to see a doctor. We asked about pain, swelling or redness in legs or calves because PICC use has been associated with lower extremity DVT.17 Patients who no longer had a PICC in place were also asked whether they were told they had a bloodstream infection. Those who endorsed either having fevers or having been told they had a bloodstream infection were asked whether: (1) the doctor indicated the symptoms/infection might be due to the PICC, (2) they had been admitted to the hospital, or (3) they had been prescribed antibiotics. Patients with a PICC still in place were also asked about function-related complications including difficulty with flushing or operating the PICC and restrictions in daily living or social activities. After completing the structured set of questions, patients were asked if they had any other problems with the PICC that had not been discussed; verbatim responses were recorded. Copies of the instruments are available in the online supplementary appendix 1 and online supplementary appendix 2. In addition to collecting patient-reported outcomes, research staff performed a review of medical records covering the same 70-day timeframe. Information collected included number of PICCs placed, number of lumens, insertion and removal dates and any documented occurrences of complications or signs and symptoms of a possible complication as included in the patient interview. Documentation of CLABSI or DVT was identified by an explicit statement of the condition by a medical provider in the notes section of the medical record. Medical outcomes of interest were reports by patients of a potential medical complication, as indicated by positive responses to the signs and symptoms described above that might indicate an infection, DVT or other minor issue like site redness. Functional outcomes while the PICC was in place included reports of difficulty with operating the PICC as well as those associated with quality of life such as activity and social restrictions. A summary measure of any reported complication, incorporating all outcomes, during the 70-day time frame was also created. We calculated descriptive statistics for all variables of interest, including baseline patient characteristics (n (%), mean (SD)) and potential complications (n (%)). The primary outcome was the percentage of patients reporting a potential PICC-related complication at any time during the 70-day follow-up period. We also assessed the percentage of patients who reported a potential complication at each assessment time point (14, 30, 70 days) based on whether the report occurred while the PICC was in place or removed. Additionally, we compared patient-reported responses of signs and symptoms suggestive of a bloodstream infection or venous thromboembolism with documentation of CLABSI or DVT in the medical record. All analyses were performed using Stata MP V.15.0 (College Station, TX). From August 2015 through May 2017, a total of 1006 patients were identified as potentially eligible to participate in the study across the four hospitals. Of these, 623 were deemed eligible and 479 (76.9%) provided written consent. 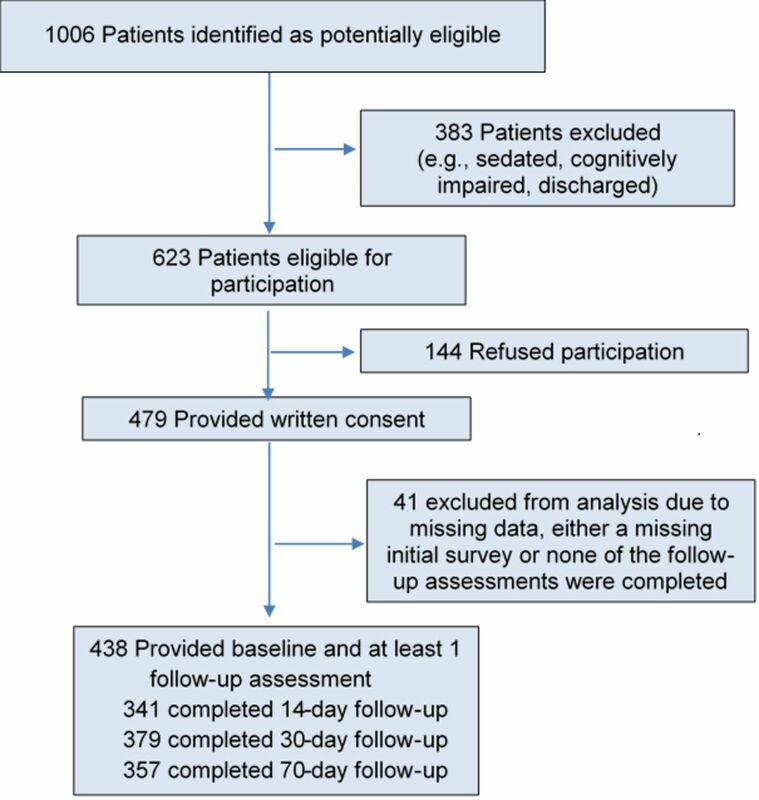 A total of 41 participants were subsequently excluded due to missing data (either no initial survey or no response to the three follow-up surveys), resulting in an analytic data set of 438 patients (91.4% of those consented for participation) (figure 1). Approximately 60% of patients (n=264) responded to all three of the follow-up surveys. Study enrolment and follow-up. In total, 1006 patients were initially identified as potentially eligible to participate in the study from the four participating study sites. Of the 623 who met eligibility criteria, 479 (77%) agreed to participate. Those who did not complete at least one follow-up assessment (n=41) were excluded from this analysis due to missing data. On average, participating patients were 56 years of age. Two-thirds were male and the majority were white (79.2%) (table 1). The most common reason for PICC placement, as reported by patients, was long-term antibiotic therapy (43.4%), followed by chemotherapy (20.5%) and difficult venous access (16.4%). Most patients (79.2%) reported that their PICC had been placed by a vascular access/PICC team nurse. About 17% of patients indicated that more than one placement attempt was required and nearly 30% reported experiencing pain, discomfort, bleeding or other trauma during insertion. Over 80% of those participating had only one PICC during the 70-day follow-up period. Dwell time for the initial PICC was 5 days or less for about a quarter of participants and over 30 days for 30% of patients. Nearly 42% of patients had a single-lumen PICC, while 47.3% had a double-lumen device. During the 70-day follow-up period, 61.4% of participating patients reported at least one possible PICC-related complication or adverse effect. This included, as shown in table 2, signs and symptoms of potentially serious medical complications such as possible bloodstream infection (n=77, 17.6%) or DVT (n=134, 30.6%). Specifically, with respect to bloodstream infection, 12.1% of patients (n=53) indicated having fever, chills or other symptoms suggestive of an infection that required them to see a doctor at one of the three follow-up time points. Approximately 40% of these patients reported a doctor indicated their symptoms might be due to an infection related to the PICC or being admitted to the hospital; more than 70% reported receiving antibiotics. Among patients whose PICC had been removed, 8.0% (n=31) indicated they were told they had a bloodstream infection; 24 of whom reported a doctor indicated the infection might be related to the PICC or admission to a hospital and 27 (87.1%) were prescribed antibiotics. Although CLABSI was documented in the medical record for seven patients, only three were also part of the group of 77 patients who reported signs and symptoms of an infection or being told they had a bloodstream infection. Of the 134 patients reporting signs of a possible DVT, 13.0% reported redness, pain or swelling in the arm where the line was inserted, 8.4% chest pain or shortness of breath requiring them to seek care and 18.3% had pain, swelling or redness in their lower extremities. Documentation of DVT was identified in the medical record for 31 patients. However, only 14 of these patients were among the group of 134 who reported symptoms of a possible DVT. In addition to signs and symptoms of CLABSI and DVT, more than one-quarter (27.9%) of patients reported experiencing at least one minor complication. In particular, 21.7% noted redness around the insertion site, both while the PICC was in place and after removal. Other commonly described issues were discomfort, inadvertent removal, migration or a difficult removal (8.4%). Longitudinal analyses of the patient-reported signs and symptoms showed differing trends of patient-reported complications. For example, while the PICC was in place (figure 2A), the percentage of patients reporting issues such as insertion site redness and upper extremity redness, pain or swelling decreased over time. 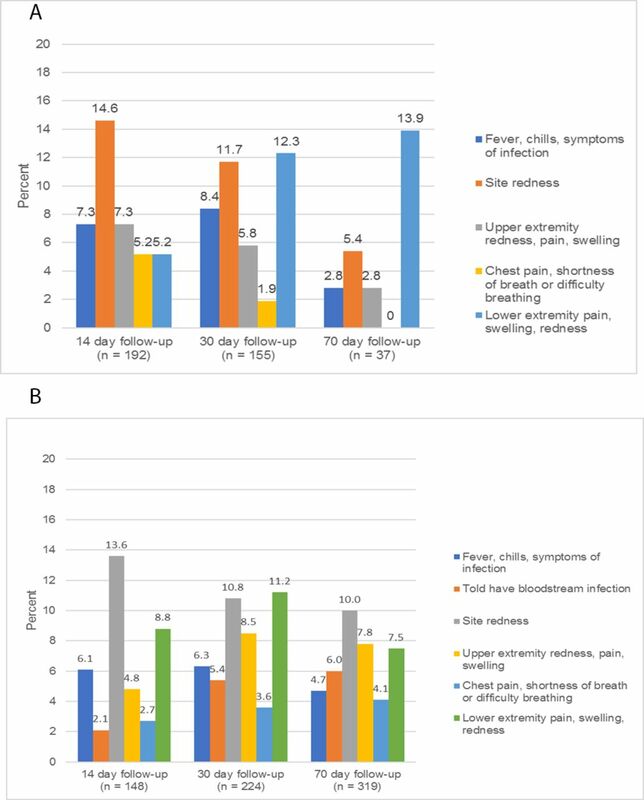 On the other hand, the percentage reporting signs of potential infection (ie, fever, chills) increased slightly from the 14-day follow-up (7.3%) to the 30-day follow-up (8.4%), while the percentage experiencing lower extremity pain, swelling or redness showed a more substantial increase from 5.2% at 14 days to 12.3% at 30 days. Likewise, nearly 14% of the 37 patients with a PICC in place at the 70-day follow-up reported lower extremity pain, swelling and redness, raising concern about possible DVT. Among patients with the PICC removed (figure 2B), the percentage reporting site redness decreased over time (from 13.6% at 14 days to 10.0% at 70 days). (A) Patient-reported medical complications while peripherally inserted central catheter (PICC) is in place (by type, at each reporting time point). (B) Patient-reported medical complications with PICC removed (by type, at each reporting time point). While PICCs remain an important part of medical care, our assessment of patient-reported complications across a diverse patient population provides novel and important insights about potential harm from these devices. For example, we found that over 60% of patients reported experiencing at least one potential complication related to their PICC. In addition to signs or symptoms associated with certain medical complications, patients reported challenges related to PICC use as well as activity and social restrictions. Moreover, nearly 30% of patients reported pain, discomfort, bleeding or trauma on insertion—a surprisingly high percentage. Our findings also demonstrate that patient-reported outcomes can serve as a complement to traditionally reported metrics, which are primarily based on medical record data, to help identify further opportunities for mitigating PICC-related complications and inform programmes designed to improve the patient experience for those with PICCs. The fact that PICCs are associated with serious medical complications, such as CLABSI and DVT, is well established.7 9 18 19 The estimated frequency of these events among adult patients in the USA generally ranges from <1% to 6% for bloodstream infection,9 10 20 21 and excluding studies that involve screening for thrombosis from 2% to 15% for DVT.10 18 22 While the estimates vary, depending on study population (eg, patients with cancer, the critically ill, outpatients) and across sites, our findings also suggest that the frequency of these potentially serious complications may in some circumstances be underestimated without systematic patient follow-up. For example, while 31 patients indicated being told they have a bloodstream infection (of which nine also reported being told it might be due to the PICC), documentation in the medical record of a CLABSI was found for only three of these patients. Although these discrepancies may reflect infections not related to the PICC or misattribution of patient-reported symptoms, it is equally plausible that medical record data from the institution where the PICC was placed underestimate the true rate of PICC complications. Furthermore, given the potentially serious nature of these types of complications and frequency of certain symptoms, our findings indicate that patients need to be prepared on the specific follow-up actions to take when signs or symptoms of CLABSI or DVT occur. Despite growing use, little is known about how a PICC influences quality of life and activities of daily living.14–16 23 Available data suggest that while patients are apprehensive at first, they tend to adapt to living with a PICC,16 23 and for many, the experience is viewed as positive.14 16 23 On the other hand, the experience is substantially less positive for those who experience a PICC-related complication.15 24 Our findings add to what is known by providing data on how many patients experience some degree of negative impact during PICC use, with more than a quarter of patients endorsing restrictions in activities of daily living and 14% social activity restrictions. Moreover, almost one in five patients experienced challenges with operating their PICC, including flushing and accessing the device. Several patients also described issues with PICC dressings, including ‘itchiness’. Although these types of complications may not be viewed as critical from a medical perspective, they are important to patients and can lead to unnecessary anxiety or even additional healthcare utilisation. The complications that receive serious attention from healthcare providers are likely only the tip of the iceberg of all bothersome or anxiety-producing adverse effects associated with PICCs, from the patient perspective. As such, well-defined strategies for ensuring that patients are properly monitored, informed and equipped to deal with not only potential medical complications but how their lives will be affected by having a PICC are clearly needed. Our study has several limitations. First, our assessment of patient-reported complications primarily relied on patients answering a structured set of questions regarding certain signs and symptoms. Although these questions specifically asked about issues related to PICCs, this strategy may have resulted in patients reporting symptoms (eg, chest pain and shortness of breath) related to another underlying condition. However, whether related to the PICC or not, our study shows that such symptoms are of concern for patients and suggests a need for further investigation to ensure that these issues are appropriately addressed. Second, we did not collect data about patient comorbidities or patient literacy, issues that could potentially influence the rate of reported complications; we thus cannot adjust for these factors in our analysis. Third, because some patients likely received follow-up care at non-study facilities, we are not able to verify all patient-reported occurrences of a possible CLABSI or DVT as we did not obtain medical records from these sites. Finally, although we report study findings in aggregate, site-specific differences in patient-reported complications were also observed, likely reflecting local practices and types of patients treated. Our study also has several strengths. To our knowledge, this is the first large-scale study focusing on patient-reported PICC complications from a diverse sample of patients who received care at different hospitals. Second, we followed patients prospectively over an extended 70-day period regardless of PICC presence to identify medical and non-medical complications and assess how signs and symptoms vary over time. Third, this study demonstrates the feasibility of collecting patient-reported outcomes and the utility of going beyond the hospital setting to better understand, target and alleviate PICC-related complications. Although increasing PICC use highlights the importance of these devices for delivering important medical therapies, ensuring safe and appropriate use remains paramount. Our findings reveal that more than 60% of patients report experiencing signs and symptoms of at least one PICC-related complication or adverse effect, including challenges with PICC use and negative effects on physical and social function while living with a PICC. Bothersome complications from the patient perspective are clearly more common than those that typically rise to the level of healthcare provider attention or concern. Understanding the patient experience is therefore a key step in not only developing strategies to better monitor PICC-related complications, but perhaps more importantly for providing patients with the support they need to ensure safe, effective patient-centred care.
. Peripherally Inserted Central Catheters (PICCs) and potential cost savings and shortened bed stays in an acute hospital setting. Ir Med J 2018;111:670.
. Experiences of patients with abnormal extubation of PICC tubes: a qualitative study. Int J Clin Exp Med 2015;8:19297–303.